You are here: Home / Food / Asparagus – it must be spring! 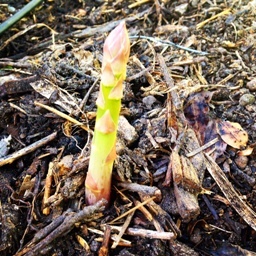 Spring has sprung – and so has our asparagus! Let’s face it: spring just isn’t the same without enjoying the fruits of the season. Certain fruits and vegetables have become synonymous with spring – peas, the first strawberries of the season, and of course, asparagus. Referred to by many as the essence of spring, you can now buy wonderfully fresh bunches of this elusive veggie at the OZCF market on Saturdays. And let me tell you, the pale bunches of spears that you can buy throughout the year in the shops are just that: pale imitations of the real thing, the bright green and mauve spears of which are bursting with fragrant spruce juice. This is the first year since the establishment of the OZCF that asparagus are being harvested. That’s because asparagus, like most good things in life, requires time and patience. The plant needs a couple of years of growing to build up its strength in order to send out bountiful spears when the time is right. But for people like Mark Harding, one of the full time gardeners at this urban farm, the wait is over. During the month of September and also a couple of weeks after, it’s harvest time. “Always cut your asparagus, close to the ground, never break it off,” he advises as he shows me the row of plants at the farm. If you are planning to plant some asparagus of your own, you will need some space (as the root system or rhizomes spread to take up quite a bit of room underground) and ample sunlight. Furthermore, you need compost rich soil and the ability to resist the first year’s growth. “Asparagus is like garlic,” says Mark, “it needs a patient hand”. Add to that a bit of protection from the wind, a nice companion in the form of tomatoes, basil, coriander or rocket, and Bob’s your uncle. If you’re without your own patch as of yet, then drop by the market this weekend or the next, and you might just nab a bundle of spears, as fresh as it gets. Time is running out, for in a couple of weeks Mark and his colleagues will stop harvesting to give the plant some R&R for next year’s growth. Trim the harder lower parts of a bundle of spears and wash well. Steam the spears in a pot of lightly boiling water for a couple of minutes until they turn bright green in colour. Remove immediately, drain and refresh with ice-cold water to halt the cooking process. Lay the spears on a serving plate and drizzle with good quality olive oil and a dash of lemon juice, to taste. Garnish with shavings of good quality Parmesan. Give the cheese a moment to settle and soften onto the still warm spears. Serve – and enjoy. And there you have it: spring on a plate!